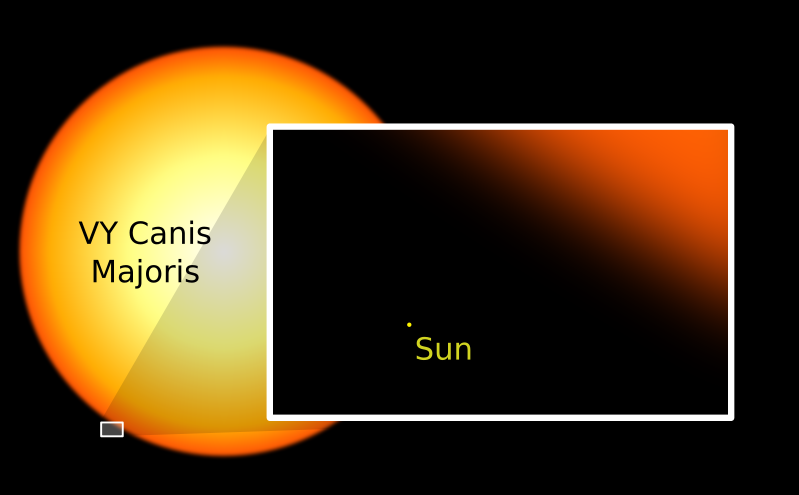 VY Canis Majoris is a red giant star located in the constellation Canis Major. Measuring between 1800-2100 times the size of the Sun, astronomers think that this star is at the end of its life, and will explode as a supernova in the relatively near future. So, what would a VY Canis Majoris supernova look like? Astronomers classify VY Canis Majoris as a red hypergiant star – it’s thought to have 15-25 times the mass of the Sun. During the main sequence phase of its life, it probably had upwards of 40 times the mass of the Sun, but it has been blowing much of its material into space with its powerful stellar winds. It has a surface temperature of 3,000 kelvin, which is relatively cool for a star. VY Canis Majoris is at the end of its life. It lived a short life in the main sequence phase of its life, and then ballooned up as a red hypergiant. It will remain in this phase for a few hundred thousand years. Exactly how long the star will last isn’t known, but it doesn’t have millions of years left. Once it finally runs out of fuel in its core, the star will collapse down and become a core-collapse supernova. This is where the central regions of the star become a neutron star or black hole, and the outer regions are ejected into space. For a few days or weeks, the wreckage of the explosion will outshine the rest of the galaxy, and be easily visible from here on Earth. Don’t worry, we’re not in any danger. VY Canis Majoris is located 5,000 light-years from Earth; all we’ll get to see is a pretty light show when the star finally explodes. We’ve written several articles about VY Canis Majoris for Universe Today. Here’s an article that explains why it’s the biggest star, and here’s an article about the star itself. If you’d like more information on VY Canis Majoris Supernova, check out Hubblesite’s News Releases on Supernova, and here’s a link to the NASA Science Homepage: Supernova for recent stories and images. Next PostNext What is the Center of the Earth Made Of?